Before Artisan, your choice for an outdoor kitchen came down to premium American-made brands at a high cost, or much less expensive (and much lower quality) imports. At Artisan, we strive to offer affordable luxury with all the quality and features you expect in premium American-made appliances and accessories, at prices normally only imports can offer. 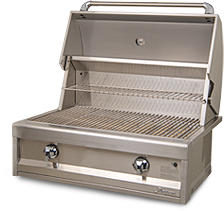 Artisan grills are available in free-standing cart models. All stainless steel cart includes slide-out tray to hold 20lb. L.P. cylinder, side trays, and heavy-duty locking casters. Ships fully assembled. 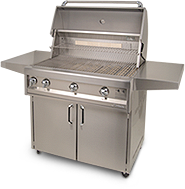 Add "C"ÂÂ to any grill part for cart model. Powerful electronic ignition with special gas capture covers for easy, fast, and reliable startup. Two-position warming rack stores conveniently up out of the way when not in use. 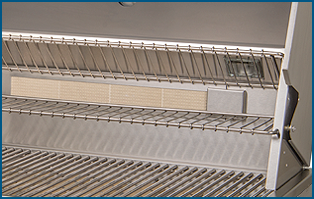 Warming rack and grill racks made from solid stainless steel rod for long life and easy cleaning. Built-in halogen work light and rear infrared rotisserie burner standard on Classic models. Recessed vertical control panel protects chrome knobs and switches from the elements. Powerful, reliable electronic ignition with 600º heat-resistant encased wiring for easy startup. Unique air curtain chimney design keeps controls cool to the touch even with lid closed. 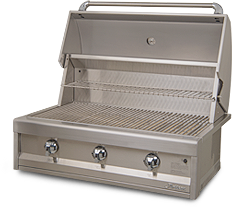 Built from all 304 series stainless steel for long lasting beauty and resistance to the elements. Seamless welded double skin hood with hand-polished accents and full width handle. Attractive high-touch bullnose and nameplate complete with an elegant yet functional design. 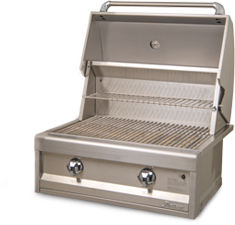 Optional on every Artisan grill, the Infrared Searing Burner reaches incredibly high temps to quickly caramelize food, locking in juices and flavor. 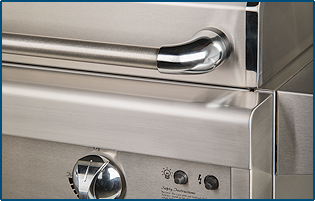 Easily swaps with standard U-burner to add extra versatility to your grill.